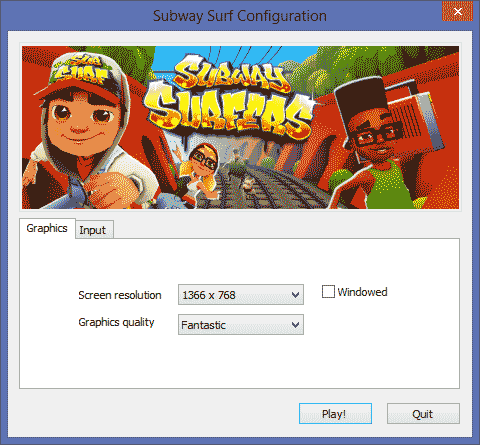 Want to play Subway Surfers on your Windows PC? Yes? You can now download an play this endless running game like other windows games without any emulator. Subway Surfers is one of the most popular endless running game on Google Play Store. It gained large number of user base in very short period and flaunts of having 5 stars rating from millions of gamers. It has 4.4 rating on Play Store, 4.5 on Amazon. It's an awesome game and I like it playing each day. In the game, you're a funky sprayer who like applying graffiti on a railway station. And you're chased by a policeman and his dog. Well, you have to keep running avoiding the obstacles. You have to collect some coins to boost up and unlock all characters and parts (like you did in Temple Run). The game play environment and fun part make it much better than Temple Run. And the most interesting part is that it's a free game and you'll not need to pay anything. 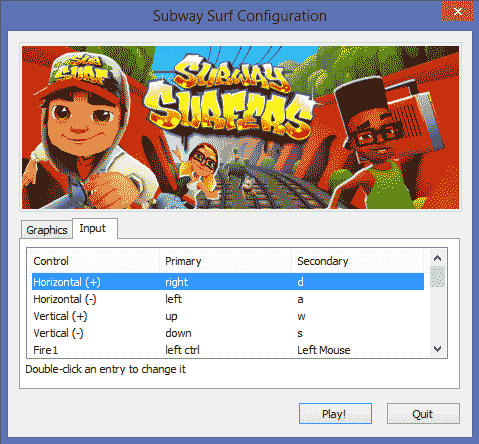 Today, I have a very simple tutorial which will allow you to play Subway Surfers game on your Windows PC. Many users installs Bluestacks Android Emulator to run popular android games. But it consumes lots of memory and and disk space. And if you have a mid-range PC than it may use all the system resources and will make your PC to hang. Is there a way to play Subway Surfers without any Emulator? Yes! Read this tutorial and download portable version of this game for your Windows PC. First, download the ZIP file containing the game from this link. Extract it anywhere on your Hard Disk Drive. Double click on Subway_Surfers.exe file to launch the game menu. Choose your screen resolution. If you want to play in Windowed mode than tick on windowed radio button. Click Play button and start exploring the game. You can play an endless running T-rex game on Chrome when you go offline. It's a cool game. You'll like it. You may face difficulty playing game without keyboard. If you want to use keyboard to control Subway Surfers than follow these steps. In the ZIP file you'll see a file Keyboard_Controls. Now start playing the game as explained above. Press CTRL+SHIFT+E when you're fatigued playing the game. It will close the keyboard control script. Want to change keyboard controller hot keys? Open the game menu as I explained above. Move to Input tab, Double click on the entry you want to change. By default, you will use the following keys to control the game. Up key - To make a jump. You can also press Space key to do the same. Left and right key - Press left key to move left and right key to move right. Down key - Press this key to go from inside of some obstacles. ESC - If you want to quit the game. You'll definitely like playing this game. Have fun. if you aren't able to play the game following above steps than try installing Microsoft Visual C++ Package and hopefully it will work without any lag.